1. Preheat the oven to 190ºC, gas mark 5. 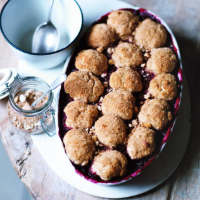 Reserve a spoonful of the caster sugar and put the rest in a pan with the frozen berries and cook gently for 3–4 minutes until the juices start to run. Spoon into a 1.2-litre ovenproof dish. 2. Sift the flour into a bowl and rub in the butter. Stir in the reserved caster sugar. Beat the egg with the milk and stir into the flour. Mix quickly to a soft dough and knead lightly on a floured surface. Roll into 16 balls and arrange over the fruit mix. 3. Mix together the crushed Krisprolls, cinnamon and demerara sugar. Brush the balls with milk and scatter with the Krisproll mix. Bake for 35–40 minutes until the cobbler is golden and cooked through. Serve hot from the oven with custard or vanilla ice cream.